What are driver rankings, and why have they become such a controversial subject? 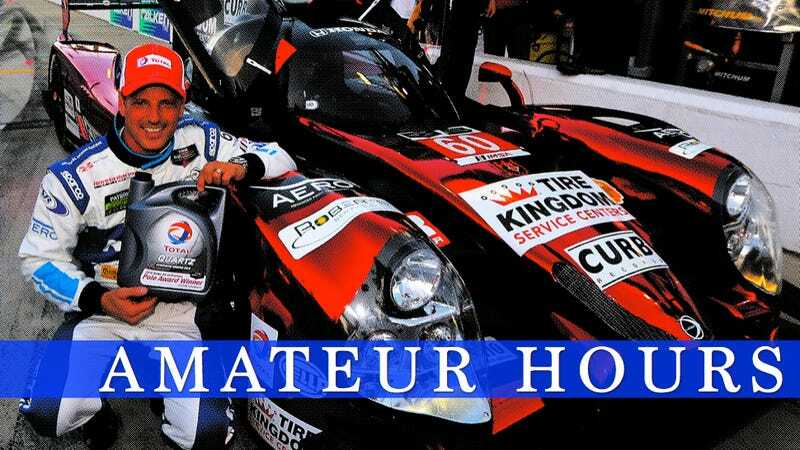 In order to keep racing fair, the FIA created a system that's so unfair to some drivers that they fight to be ranked lower than their skill, which explains how a guy who won the Rolex 24 twice in a row could be classified as an "amateur" in that same race. In certain classes and categories of sportscar racing, teams have to have a certain number of amateurs — drivers ranked Silver or Bronze — in order to field a team. Problem is, many professionals are successfully petitioning to be reclassed as Silver drivers in order to maximize the number of opportunities to drive. The very system that's meant to protect amateurs and keep them in amateur and pro-am classes is crowding them out of a ride. On the flip side, many professionals who are accurately classified as Gold or Platinum are having difficulties finding opportunities to drive compared to the guys who are under-rated for their skill level. How did it get this way, and why does this system exist? Let us explain. What (In Theory) Is A Driver Ranking? Drivers are ranked in four categories, all named after precious metals: Platinum, Gold, Silver and Bronze. The idea has its roots in the FIA GT3 category. GT3 had a problem with manufacturer teams using the amateur GT3 series as a place to run their factory drivers and of course, dominate accordingly. Problem is, amateur (or "gentleman") drivers are the ones who often fund privateer efforts in series like GT3, yet they were being driven out of their own category by drivers who were much better. In order to keep some semblance of balance, the FIA instituted driver rankings for the series and enforced limits as to how many pros you could have in certain types of cars. These Gentleman drivers are often recruited into a team and basically sponsor the team in exchange for driving and in most cases, hope to improve their skill and pace behind the wheel. In endurance racing typically 2-4 drivers share a car throughout a single race, so if a gentleman driver is paired up with a professional, he or she can learn a great deal. Of course, in the majority of the cases the gentleman drivers are significantly slower than the Professionals. This puts their car or team at a severe disadvantage to other cars which are competing with a full lineup of professional drivers. For some of us, this doesn't matter— we want to compete against the best in order to improve ourselves. However, for a lot of people this is a large hurdle to overcome when spending large amounts of time and money on racing. In addition to keeping things fair from a competition standpoint, the regulations involving rankings in pro-am sportscar classes are also meant to keep amateurs in the sport. For 2015, the FIA GT3, IMSA and WEC driver ranking lists were consolidated into one FIA Driver Categorization list, presumably because they realized that racers are going to driver whatever they can get their hands on, so they might as well make it convenient. That list, if you're curious, can be found here. Like balance of performance mods that keep the pace of the cars equal, the idea was to balance out the level of talent on certain kinds of teams based on driver talent. Drivers are initially categorized on age and experience by an FIA committee, and then on their average times posted in races. Drivers have to submit an exceedingly detailed application to the rankings committee, and if they feel as if they've been categorized incorrectly, they can always submit an appeal. is a driver whose performances and achievements, despite note being covered by one of the definitions above, may be considered as Platinum by the Endurance Committee. is a driver whose performances and achievements, despite note being covered by one of the definitions above, may be considered as Gold by the Committee. is a driver whose performances and achievements, despite note being covered by one of the definitions above, may be considered as Silver by the Endurance Committee. Amateur driver. Any driver holding an International B licence without a significant record of achievements in motor sport but whose level of performance can be considered as Bronze by the Endurance Committee. In theory, anyone who makes a living off of their driving should end up as a gold or platinum depending on experience or age, and amateurs should end up as silver or bronze, with silver being the category for either talented amateurs who'll likely stay that way or new talent working their way up to pro status. What (In Practice) Is A Driver Ranking? The biggest problem with the rankings as they are is that the entire system doesn't reflect the nature of the current driver market. Some very good professionals have been ranked as Silver. Others, for whatever reason, are stuck in Gold. Team requirements then seem quite arbitrary, given that the current rankings for drivers themselves make about as much sense as entering a spork in Le Mans. LMP2: A crew of 2 or 3 drivers must include at least one Silver or Bronze driver. Lest we think this is some kind of Harrison Bergeron-style "handicapping" system of the pro-am LMP2 and LMGTE Am categories with slower drivers, sportscar teams and drivers have both discovered that getting the best drivers with the worst rankings is key to success. Rui Aguas was Gold, is now Silver. Max Angelelli has been added as Gold. Earl Bamber was Silver, is now Gold. Dominic Cicero has been added as Bronze. Andrew Davis was Gold, is now Silver. David Empringham was Gold, is now Silver. Michael Guasch was Bronze, is now Silver. Scott Hargrove has been added as Gold. Ian James was Gold, is now Silver. Michael Johnson has been added as a Silver. Robbie Kerr was Platinum, is now Gold. Cameron Lawrence has been added as a Silver. Anthony Lazzaro was Gold, is now Silver. Marc Miller has been added as a Silver. Ozz Negri was Gold, is now Silver. Alessandro Pier Guidi was Platinum, is now Gold. Andy Pilgrim has been added as Gold. Martin Plowman was Gold, is now Platinum. Boris Said was Gold, is now Silver. Madison Snow has been added as a Silver. Owen Trinkler has been added as a Silver. Kenny Wilden was Gold, is now Silver. Some of these make sense, such as Earl Bamber and Madison Snow, since both come from the world of GT3 Cup racing and are quickly making a name for themselves in higher level series. Seeing longtime professionals such as Ozz Negri, Boris Said and Andrew Davis recategorized as Silver, however, is a bit of a head scratcher. Ben Collins—the friggin' Stig—is also a Silver. The way they define what is a pro or what is a silver is wrong. For instance, by their written criteria I'm a silver. But I'm definitely a gold. I do this for a living. I compete on a pro level and get paid to do so. They've made me gold (because I talk a lot) and I don't disagree. But when I'm losing jobs because of it to other drivers who should be gold and aren't, then I have a problem with it. Another interesting thing is what doesn't count at the moment: specifically, the ever-growing Pirelli World Challenge series. Technically, if we're going by the line about works drivers in the FIA's definitions, Eversley would now be a Platinum given his factory drive with Honda Performance Development, even though the rest of his experience doesn't fit with the overall idea of what a Platinum driver is. There are so many ways to argue for one class or another based on the wording that it all gets a bit silly. We're talking about racing drivers, not nitpicky pre-law kids who want to chop through the definitions of "is" and "an," right? Likewise, fellow World Challenge drivers have been able to gloss over their experience with the series to get a Silver ranking. Mike Skeen scored numerous race wins and second place in the highly competitive GT championship in Pirelli World Challenge last year, yet he remains a Silver. Pierre Kleinubing has won the Pirelli World Challenge Touring Car Championship multiple times, yet he is a Silver as well. Clearly, being an under-rated Silver is where you want to be, and I can't fault anyone who successfully petitions for it. It's just smart, and opens up the most doors. You can race in any of the categories in WEC as well as in TUDOR United SportsCar as a Silver, including Prototype Challenge and GT Daytona. I'm a professional driver, I should be ranked Gold, but there's so much less use for a Gold driver, that it's not a rewarding position to be in for those who have worked really hard to get to this point. And it's providing opportunities for guys who have not been actively racing for a while and aren't recognized as top level, yet being ranked lower is giving them all this opportunities because teams are trying to get around the current situation. They're going to look for the best-ranked silver they can find. Why is IndyCar star and 2012 Rolex 24 race winner Justin Wilson walking around without his firesuit on and helmet in hand? No seats available. With the entries down from 67 to 53, the numbers tell the tale. Fewer teams are here, costs to run are higher than ever, and if a team can find a paying driver with 75 percent of the talent a Justin Wilson (or similar) offers, you know which option many have chosen to make. Fortunately for them, longtime professional driver Boris Said just got reclassified as a silver. Yes, the same Boris Said who developed a reputation as a road course specialist in NASCAR, was the first American to win the 24 Hours Nürburgring and won the Rolex 24 back-to-back in 2004 and 2005. Uh-huh. No offense to Boris, but that doesn't sound amateur. Clearly, something's off when amateurs are posting lap times in a race that are that close to their professional counterparts. It's endurance racing, too, so the emphasis isn't exactly on stonking fast lap times as it is going just fast enough to stay ahead of the other cars while still preserving your car 'til the end of the race. Clearly, that piece of the rule doesn't make a lot of sense. How Can We Make The System Work As Intended? When this weekend's pole for the Rolex 24 at Daytona was scored by a Silver, something is clearly borked with the way the different categories are defined. They're clearly not "amateur" and "professional" classes, yet there's still a clear need for a driver-based requirement of some sort to allow amateurs (or alternately put from a financial standpoint, drivers who can fund the team) to participate in the classes designed for them. How do we make the system fair to drivers and team owners alike? A twin turbo Honda V6 like the one in your Accord just got pole at the Daytona 24. I suggested making it just PRO/Am. No middle levels. They don't matter. If a platinum and a gold can't drive together in a short race than they're basically the same ranking if you think about it, Pro. And if you can run an unlimited amount of AM's in a car I.E. 2 bronzes or 1 bronze and 1 silver than just call that "Am". And then finally, let the teams and drivers decide who's a pro and who's an am. Collectively. We would never allow someone to have an advantage but right now it's really coming down to who can game the system better. Do you drive a race car for a living? Boom. You're a pro. Rides would inevitably go to the more talented end of the professional pool, leaving ample room for actual amateurs to fill the "am" spots. Interestingly, this is the one piece of the argument that Starworks team owner Peter Baron would agree with: the need for a division between those who race for a living and those who bring funding to the team. He argues that you have to go back to the concept behind the bronze and silver driver categories to understand them, particularly when it comes to the financial part of it. Gentleman drivers bring money to the teams and make sure that teams are able to keep participating. Baron feels as if many of the biggest complainers about the current system are falsely accusing many of the more talented silver drivers of being "pros" when they're actually bringing a lot of cash to the team, just like any other gentleman driver. While he acknowledges that "the ACO could do a better job" when ranking some drivers, he also argues that the silvers who are wrongly classified are typically bumped back up to gold after a year, anyway. Most of the complaints are revolving around one-off races such as the Rolex 24, where teams have more drivers run than usual. "The people who are complaining about it are not responsible for the bills or don't pay the bills," explained Baron. He feels as if a lot of the animosity towards the driver ranking system coming from "drivers who don't bring any money" who are "thinking selfishly about themselves." A driver's intent, he argues, must be factored into the equation, particularly when it comes to keeping teams well-funded enough to stay in the series. If a driver makes a living racing, yes, they're a pro. If they have a primary job elsewhere, they're clearly not. Pro-am race teams rely on those amateurs to pay the bills, so they're a needed component who needs to remain happy with the general direction of the sport. While much of the debate on driver rankings is about "Silver pros," the financial needs of teams need to be taken into consideration as well. The biggest issue, then, is in the details of how rankings are assigned and named. Clearly, the division isn't in varying shades of "professional" and "amateur." Touring car driver Robb Holland feels as if he has an ingenious solution for the pro-am classes based on a 100-point scale. We have all manner of data on drivers at our fingertips in regards to performance of the car as well as performance of the driver. Instead of using a list of criteria that is obviously subject to interpretation, different data points on the driver's performance should be given an numeric value. Teams would then be given an average number range to meet for their team. Factors that don't seem relevant, such as the age-related rules, wouldn't be an issue anymore. Have a guy who brings a lot of money to the table, but not necessarily a lot of speed? You'll be able to balance him out with a crazy good professional, easy as pie. The main challenge would then be finding that perfect balance between drivers who can pay and overall average talent level, but it would keep teams' talent levels roughly equal across the pro-am classes. Even such a ranking that was merely 1 to 10 would be an improvement over the current rankings system, he argues. Are Changes On The Way? In short: we don't know. The FIA did not reply to our request for a statement on the controversy, but IMSA spokesperson Nate Siebens had a few words to consider from one sanctioning body's point of view. IMSA's TUDOR United SportsCar series has come under fire for adopting the FIA's shared ranking system from drivers who feel as if it's an inaccurate system. They considered making things more open in the offseason, with only one required Silver or Bronze driver for the longer special races like the Rolex 24. However, team owners in the pro-am series gave IMSA push-back on the proposed changes to leave it as it is. Siebens wouldn't say it outright, but Baron certainly did: pro-am teams rely on gentleman drivers' funding and don't want to be made irrelevant in their own class by other teams who can afford to take on more pro drivers. Siebens also stated that IMSA is "comfortable with where we are" because they are using a worldwide standard. He believes that they aren't being insensitive, and that they do, in fact, want every talented driver to be able to find a drive. He also reiterated that two of TUSC's classes, GT Le Mans and Prototype, are wide open with no driver ranking requirements to meet at all. As one of three major series sharing the standard, they feel as if it's not their role to split off and do something different. That change has to come from the top since it involves two other series than just IMSA's. So, the onus is really on the FIA to make needed changes that make the system fair for everyone involved. Will they tweak the rankings in a way that makes more sense for both team owners and drivers alike? While everyone is certainly looking out for their own interests (which doesn't strike me as selfish per se, but more out of self-preservation), one constant rings true in nearly every comment about the current ranking system. Most of the bickering lies in the use of the terms "professional" and "amateur," when the system is also in place to ensure teams remain funded and able to participate as well. Opening up the teams to take on fewer silver/bronze drivers doesn't really get at the heart of the issue. The heart of the issue lies within the definitions for each ranking. Clearly, the current rankings themselves don't accurately describe drivers' roles within a team, and pros who didn't get the desired label are struggling to find drives as a result. For this reason, the sport needs more accurate driver rankings in order to thrive.